THE TRAGEDY AT REIGHTON GAP. Hunmanby which commemorates this event. Hunmanby Primitive Methodists took their Sunday school on its annual 'treat' to the seaside at Hunmanby Gap. Both my late father and his sister were present as Sunday-school pupils. The tide was going out so they walked south along the sands to Reighton Gap where the sands were more suitable. The usual games were organised and a substantial picnic tea was laid out at the bottom of the cliffs. In the meantime the tide had turned. There was no danger to the Sunday School party who were accompanied by responsible adults that kept the children under control. Sadly, quite unconnected with the Sunday school outing, a young nursemaid, left in charge of five small children whose two families were holidaying in Hunmanby, had taken her small charges down to the beach, with the full knowledge of their parents. Anyone familiar with the beach at Reighton Gap will recall that at times, the sand there is formed into pronounced dunes by the tides. The nursemaid and her charges were playing near the waters edge on one of these dunes. Unaware of the danger of the tide encircling the dune and cutting them off, they played happily in the water. Adults in the Sunday school party soon appreciated the problem but they were 150 yds away. Shouting and getting the nursemaids attention, they ran to the rescue. By now the oncoming waters were flowing swiftly around the dune. Strong, fit country men were washed off their feet as they tried to reach those marooned. Each time a child was passed to them it was swept away and all five perished but the stronger nursemaid was rescued. 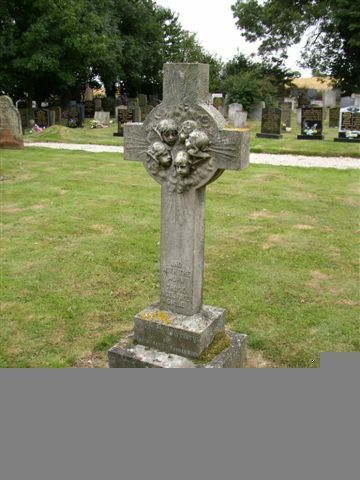 Three of these tragic children are buried in 'God's Acre' cemetery, Hunmanby. William Dove (Sen.) was commissioned to make a headstone by the grieving parents. Master craftsman that he was, he produced the one shown in the photograph. He sculpted five angels heads in a radiant sunbeam. 'AND WITH THE MORN THOSE ANGLE FACES SMILING'. Not all Sunday school 'treats' ended on a happy note.